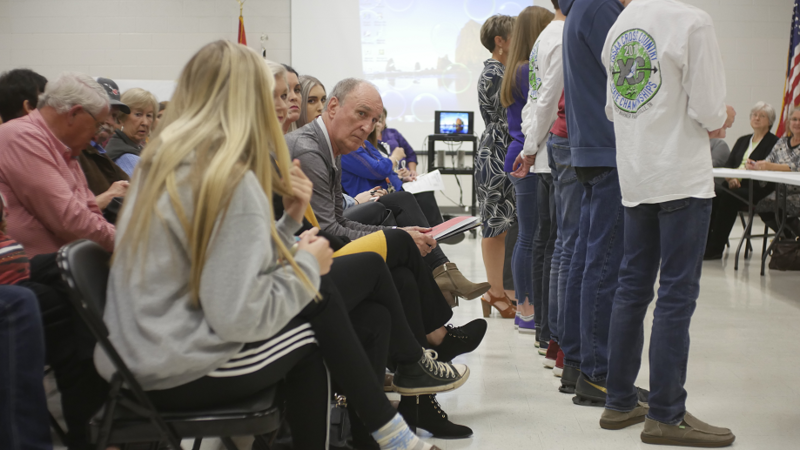 Karen House : Nov. 5, 2018, 8:39 p.m.
Tommy Layne (center) waits to speak while the Sequatchie County Board of Education honors the high school crosscountry team. 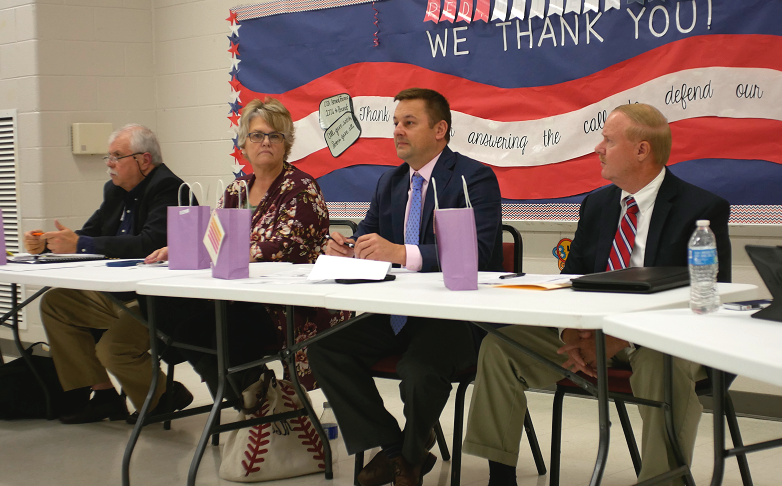 Nov. 5, 2018 – A wall-to-wall crowd attended the Nov. 5 meeting of the Sequatchie County Board of Education (BOE), most of them in support of the demoted principal of Sequatchie County High School (SCHS). SCHS Principal Tommy Layne was transferred 10 days ago to Griffith Elementary School (GES), as a full-time/substitute teacher, for undisclosed reasons. 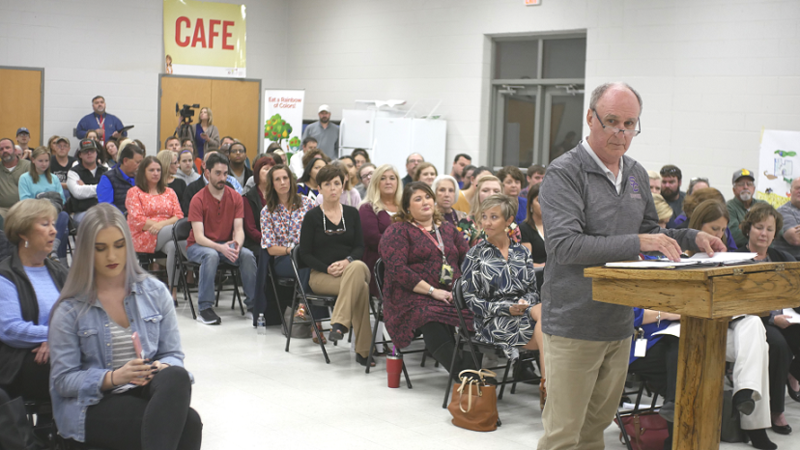 Nearly 200 people attended the meeting Monday night at GES and listened as Layne expressed his grievances to the school board. Board Chairman Shelli Dodson told Layne he had three minutes to address the board, and then Layne distributed to each board member a copy of the letter Director of Schools Pete Swafford had sent him as official notification of his transfer. He then told the board about Swafford notifying him on Oct. 26 that after 24 ½ years as principal of SCHS he was being reassigned to Griffith. He stated that Swafford told him he had three choices, to resign, to transfer, or to be dismissed. He further stated that contrary to board policy he had received no written notice of the reasons for his dismissal. Tommy Layne protests his reassignment before the school board, in a packed meeting hall. Swafford said he told Layne to come to the central office and pick up a written notice on Monday morning, Oct. 29, before reporting for work at GES, but Layne never came to pick it up. Layne responded by telling the board that he was on sick leave for the entire week, with a back injury. He has not yet reported to GES. Hudson also recommended that Layne avail himself of the school system's appeals process. Director of Schools Michael L. "Pete" Swafford (at left) reassigned Tommy Layne to Griffith Elementary. With him on the school board are (l-r): Shelli Dodson, Sam Hudson, and Greg Johnson. Q. Did Mr. Layne do anything illegal? Q. Have the board members been given access to the evidence you have? A. I have answered individual questions from individual board members. Q. Did you verbally give Mr. Layne the reasons for his transfer? Discussed Swafford's evaluation, in which he scored an average of 4.53 on a scale of 1-5. Congratulated members of the SCHS crosscountry team for competing well at the state championships Saturday. Held second reading of school board policies, primarily focused on charter schools. Set Dec. 3 as their next meeting, to begin at 6 p.m. CST at the central office on Cordell Drive, Dunlap. Monday night's meeting was held at GES, to allow the board the opportunity to inspect the school's new gym floor.